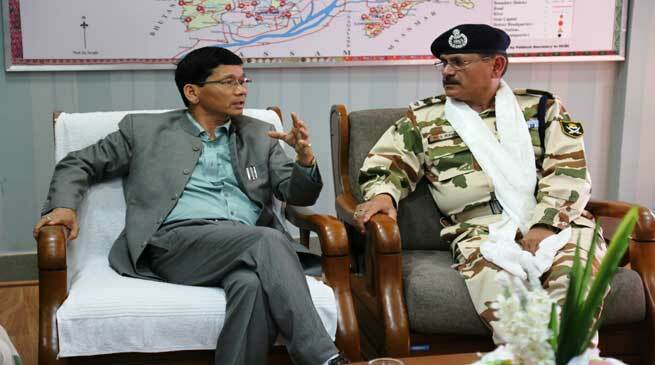 “Connectivity to the border areas is must for easy and faster movement of the defence forces in the border area” said Chief Minister Kalikho Pul while discussing issues related to border area with M S Rawat, Inspector General of Indo-Tibetan Border Police (ITBP), Frontier Sector, Shillong who called on him on Thursday in Chief Minister’s Office. He said, “Suspension bridge and CC Footsteps has to be constructed where requires and maintain to improve the connectivity in the border areas”. The Border porter track should also be maintained for facilitating patrolling in the border areas, he added. As the defence personnel serving in border areas are living a harsh life, basic amenities like education and health should be look into so that they can bring their families with them. “Proper huts should also be built and maintained for them”, he stressed. Citing strategic importance of the eastern part of Arunachal bordering Myanmar, CM urged to set up an ITBP Batallion at eastern zone too. He told that land shall be provided at minimal rate by the people. He stress for more recruitment of Arunachalee youths into ITBP as the local guys are more familiar with the locality and hilly terrains. “It will be of great help during emergency” he said. He further urged the paramilitary forces to win the hearts and confidence of the local people and to maintain good relations with the civilians. CM urged IG to place at least two dedicated Helicopters for ITBP in Arunachal for emergency services, one at Ziro for Western Arunachal and another at Mohanbari for Eastern Arunachal. He further asked the visitors to prepare an assessment report with sector wise details of infrastructure requirements, photographs of difficult areas, hurdle as well as solutions, program and also to submit a copy of demands. He said to extend full support from the state govt., district administration and the local people to them. He also informed that the state govt will make a Single Window System for forest clearance, mines & minerals and land acquisition to facilitate the armed forces, central agencies and other private sectors for speedy implementation of their project in the state. He further urged the armed forces to work in tandem with the state govt. While M S Rawat, Inspector General of ITBP apprised the Chief Minister that connectivity as the main hurdles for the armed forces serving in border areas. He also informed that due to minimal allocation of fund to the ITBP, progress of infrastructure development in Border areas in Arunachal Pradesh is very slow and seek the support of the Chief Minister in pursuing the matter with the Centre. He said that ITBP has recruited highest numbers of Arunachalee youths among the armed forces and further assured to seek special quota for Border State. He informed that currently 10 ITBP Batallions are operating in the state and 6 more battalions have been proposed for the Border areas in Arunachal, out of which 4 has been approved by the Ministry of Home Affairs. He further informed that 2 ITBP battalions are necessary for Itanagar. He further seek for reduction of VAT from 12.5% to 5% for CSD items in the state for the welfare of the defence personnel in the state. He was accompanied by Ishwar Singh, DIG, Ajay Pal Singh, DIG and Angad Prasad Yadav, Commandant, Sector ITBP.